Most people are more than aware of the shortage of NHS dentists, and finding an NHS dentist who is willing to take on new patients can be a task in itself. But when choosing between NHS and private dentists there are few extra considerations, not least of which will be the treatments offered and the costs involved. Finding an NHS dentist that is willing to take on new patients is becoming harder and harder. Many are already booked to capacity and the NHS dental waiting list is becoming longer. NHS dental care is available to everyone in the UK, and whether or not patients have to pay for their treatment will depend on their financial circumstances and age. If you have a family member already attending an NHS dentist then it will be worthwhile contacting the same dentist. Many NHS dentists do prefer to treat patients from the same family, and family dentists are also aware that common dental complaints do exist within families. NHS dentists can also be found by checking with the NHS website or by simply using the local business pages phone book. Private dentists do charge for their services and treatments can be expensive. However they will offer a lot of dental treatments that are not covered by NHS dental treatments. Finding a private dentist is usually a simple matter, and recommendations by friends or relatives should steer you in the right direction. Private dentists can also be easily found on the internet or by using the local business telephone directory. Most basic dental treatments will be available from NHS dentists. These will include x-rays, fillings, tooth extractions and root canal work. NHS dentists will not usually undertake major cosmetic dental procedures such as tooth whitening, dental implants or adult braces. In certain cases minor cosmetic work can be undertaken by NHS dentists but these treatments can cost extra, although this may be a different case where children are concerned. Private dentists should advertise the type of treatments they can undertake. Some will use the most up to date cutting edge dental techniques, while others may specialise in certain areas such as cosmetic dental surgery. If you are looking for a particular type of treatment such as dental implants then you should conduct some internet research on private dentists in your area that specialise in this type of treatment. Most private dentists will be up to date on the latest cosmetic techniques. Remember, private dentists can charge a lot of money for cosmetic dental treatments, and although this type of treatment is becoming more widely spread and popular, it is still very expensive. Regardless of whether a patient chooses NHS or private dentists, the dentist will still have the letters BDS after their name, which stands of for Bachelor of Dental Surgery. Instead of BDS the initials may read LDS, which stands for Licentiate in Dental Surgery. Regardless of whether they are an LDS or BDS all practicing dentists do need to be registered with the General Dental Council. One of the most important factors when choosing a dentist is to make sure you are comfortable and feel safe in their care. Good and bad dentists can be found in both private and NHS dental surgeries. 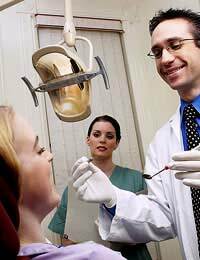 Having a dentist you like and can trust will make the dental experience easier for both the patient and the dentist. A happy patient is a less nervous one, and dentists are well aware of this fact.